A walkthrough and guide for the month of May in Persona 5 (P5). Included also are recommended activities for the Protagonist and his Confidants per day. With the Kamoshida Palace down, the Protagonist and his group of Persona users move onto May. In this month, there are exams and also many other things to do. Some new Confidants open up and you’ll find out that there’s now a stalker to deal with. When in doubt, make sure you read the dialogue well. Some of the exam questions may appear prior to the exam. You will explore a new Palace this month. For Madarame’s Palace walkthrough and infiltration guide, click here. If you have enough money: Buy 3 plant nutrients at Flower Shop, Underground Mall, Shibuya Station. Kamoshida Fallout news spreads in Shujin Academy. Sell treasures obtained from Kamoshida Palace. Phantom Thieves’ team celebration for Kamoshida’s change-of-heart. Speak to Ann. Lovers Confidant is now acquired. Take a part-time job at the Beef Bowl Shop (Proficiency +2), Central Street, Shibuya. Speak to Yuuki Mishima. Moon Confidant is now acquired. Take another part-time job at the Beef Bowl Shop (Proficiency +2), Central Street, Shibuya. Customers have specific orders. When they give their orders, they’ll be in random and will vary. Memorize them and keep a pad of paper near you. When they ask for their orders. make the right choices. You will be able to meet the Sun Confidant, Toranosuke Yoshida, in the Beef Bowl Shop. Spend time with Ryuji, Chariot Confidant. Speak to Toranosuke Yoshida at Station Square, Shibuya. Spend time with Ryuji Sakamoto, Chariot Confidant. Spend time with Toranosuke Yoshida at Station Square, Shibuya. Sun Confidant is now acquired. The group confronts Ann’s recent stalker, Yusuke Kitagawa, and meets Madarame. The group visits the Madarame’s Public Art Gallery. Phantom Thieves visits Yusuke’s residence. Also, initially investigates Madarame Palace. Ann volunteers for Yusuke’s painting. Justine and Caroline’s Strength Confidant is acquired. 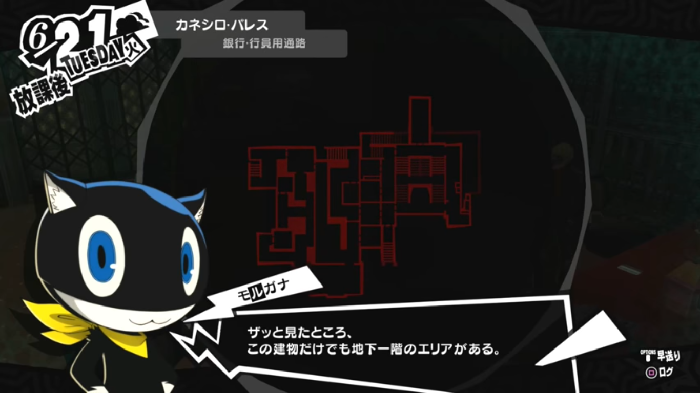 Optional: Spend time with your chosen Confidant or infiltrate Mementos Dungeon (grind and locate targets listed from Phan-site). Coffee training with Sojiro (if you didn’t infiltrate Mementos). Interact with customers to have them leave first. Visit Madarame Palace – reach the Central Garden and see the painted door. Approach the TV in Café Leblanc. Yusuke joins the team and awakens his persona, Goemon. Swap Carmen book for Goemon book, The Gallant Rogue. Spend time with Ann Takamaki, Lovers Confidant. She’s at the Underground Mall, Shibuya Station. Take a part-time job at the Convenience Store, Central Street, Shibuya. Option 1: Spend time with your chosen Confidant. Choose between Ann or Tae. Don’t forget to buy available Confidant Gifts. Read the message from Ryuji and accept the invitation. Swap Goemon book for Arsène book. Send Calling Card to Madarame. Velvet Room: Fusion Personas and Update Persona Compendium. I’m following the guide. However, on Sunday’s when we drink the juice, I do not receive the same stat increase you say we will have on the day. Did I do something wrong? I’m following the guide but on Sunday’s for drinking the juice. I get a different increase than the one you state. Why work at the convenience store may 23rd? I would like to thnkx for the efforts you have put in writing this blog. I’m hoping the same high-grade web site post from you in the upcoming as well. Actually your creative writing abilities has inspired me to get my own web site now. Actually the blogging is spreading its wings rapidly. Your write up is a great example of it. I truly think this site needs a lot more consideration. I’ll possibly be once again to read much more, thanks for that info. On 5/25 I never get a text from ryuji in the evening. Just in the afternoon asking if we are going to the palace. My Ranking with Tae isn’t as high as it should be on this date. Would this cause this issue? Wait a moment…When i should send the calling care in May? For me, it’s on your own discretion. When I played the game, I usually sent it right after finding the infiltration path. ???? But it’s really up to you if you feel ready to send the card. ???? Did anyone else get an issue for 24th where you could not reach Rank 4 with Ann? Relashionship with Ann did not grow. And i got a lovers persona.